OK, so this is not me obviously, but this girl is far cuter looking in it than I am. Talk about speeding up my shooting! Felt a little anxious to sport this new gear at first. Then I thought to myself "is it really going to matter George!?" 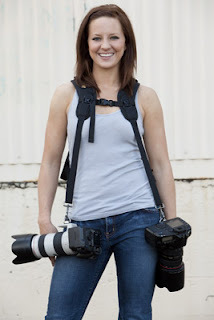 Like I would not look like a photo geek anyway with three cameras hanging off my neck using traditional neck strangling straps!! There really ain't no hiding that I am a photo geek, especially when I am working! But seriously, talk about speeding up my camera transition time. Shooting theater, this has been one of the biggest improvements to my workflow in a while. Dare I even say that has improved my work. I pick-up one body and just drop the other, then switch back again and the camera stays right were I left it always oriented, it seems, so my hands land right on the grip. No looking required. They also have some cool accessory pouches that attach to the upper part. You can check them out in the video at the bottom. Before that, check out this video Gail snagged of me putting the strap to work on a theater job. Watch how fast my camera transition time is and I am not even trying! Further, I don't even have to look at how the camera is oriented my eyes never leave the show. It is just grab and go! As for the other dual straps out there (and there are a couple), I have not tried them so I can not pass ANY judgment. I would imagine that these would work similarly, but I will say that I can't imagine having the cameras hanging any other way would do anything but slow down my grip time. That is just me though and it could be just a matter of personal preference.